this is a good article that I got in my email. it showcases early tomatoes. I have grown all of these but Novia. I am carrying SubArctic, Legend, and Black Prince. Look for my My Two Cents Worth: I will tell you my thoughts on the variety. Here’s a tip for early tomatoes. I will try it and let you know how it works. Or you can try it and let me know how it works for you. Flick the blossoms (they are self pollinating) or take a cotton swab/paint brush to pollinate your early tomatoes. Sometimes we don’t have the necessary wind or the bees aren’t out yet so they aren’t being pollinated, therefore no fruit. I don’t know why I never thought of this myself! Tomatoes are very adaptive plants, and can produce fruit in a wide variety of climates and regions. Whether you live in zone 4 or in zone 10, you can grow tomatoes without too much trouble.Although this is true it is important to choose varieties that are well-matched for the climate you live in for the best results. Some tomato varieties perform best in very warm climates, while others are bred for better production in cooler climates.If you live in a cool climate (from zone 6 to zone 4) here are five tomato varieties that should thrive for your area. Northern Exposure is a determinate tomato variety that performs very well in cool climates. They are generally ready to pick in about 67 days after transplanting outside which is great for shorter seasons.The compact size of this tomato plant makes them perfect for containers. According to my sources it is now sold on Burpee seed racks as Burpee Early Harvest Hybrid. I honestly don’t know why they change the names! My Two Cents Worth: I have grown this for sale but not put it in my own garden (I only have so much garden space). I have heard from my customers that they love this tomato. It is a very healthy plant in my greenhouse. With a name like Sub Arctic you know this tomato does well in cooler, short climates. It is a determinate variety that produces four ounce tomatoes in about 42 days after transplanting.Ideal for short seasons in the north, or for a quick harvest in southern vegetable gardens. My Two Cents Worth: I love this tomato. Grew it for years but never put it in my garden until I had a leftover plant. I put it into an enormous container and loved, loved, loved it. They are a smaller tomato, about the size of a ping pong ball, sometimes larger and very sweet and bright red. I am offering this one this year. The Legend tomato is another variety that produces well in cool climates and is resistant to late blight.It produces large fruit that can measure four to five inches in diameter and are a bright, glossy red color. This is one of the earliest maturing slicing tomatoes available. My Two Cents Worth: This is a lovely tomato, good flavor, consistent size, shape and color. Plus, it doesn’t want to take over the world. In my garden the fruit didn’t get to 5″ across but about the size of baseballs. I am offering this one this year. The Novia tomato variety is an indeterminate that produces seven to nine ounce fruit and is very disease resistant.They contain a high level of lycopene which is a beneficial antioxidant. These tomatoes perform well in cooler climates, but can also be grown as far south as zone 9. The Black Prince tomato variety comes from Siberia, so you know it is used to some cold weather and short seasons.This heirloom tomato features medium-sized fruit that are a deep red with green to purplish shoulders. They are loved for their rich, almost smoky tomato flavor and excellent hardiness in cold temperatures. My Two Cents Worth: This is very pretty tomato. One of those that are considered “black” Mine were a dark, dusky puprle with green shoulders and about the size of large eggs. The inside is a beautiful dark red and the taste is good but I honestly don”t get the “smokey” flavor. I think that is a trick of the mind! I am offering this one this year. Here in the Inland Northwest, our weather is extremely variable. Shovel pruning – cut the roots about a foot from the plants on two sides. If it’s really late in the season, do all four sides. Start picking off extra blossoms. One caveat: if it is a cherry tomato leave them alone since they take very little time to go from blossom to ripe fruit. Pick off tomatoes that you know aren’t going to have enough time to get big enough. These would be the very large, whopper size tomatoes such as Mortgage Lifter, Aussie, Big Rainbow, Rose etc. Watch the weather like a hawk protect the plants with row cover, bed sheets, tarps, blankets, anything to keep the frost off the fruit. Here we have used blue tarps. Once frost touches the fruit they will rot rather than ripen. This what a frost damaged tomato looks like. 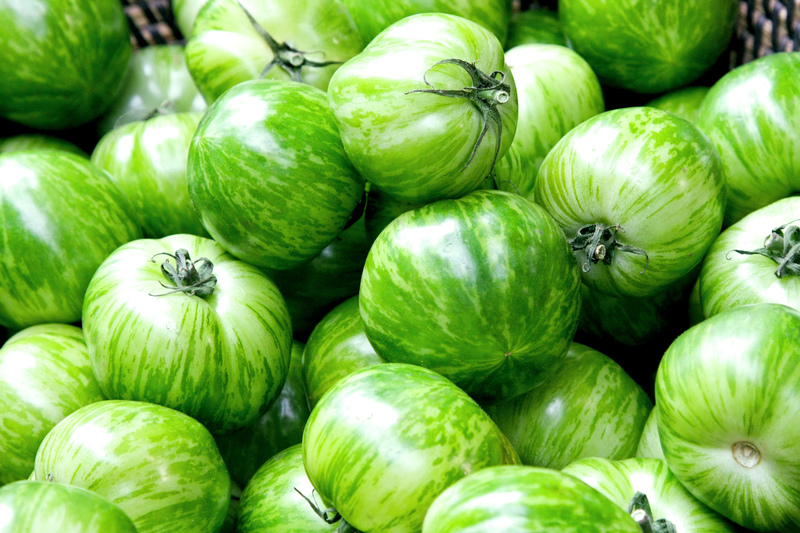 Before a hard, plant killing frost, pick all green ones and bring them inside, most will ripen, the rest you can use for fried green tomatoes or a green tomato relish. A natural and stabilized cross between Green Zebra and a black tomato by Jeff Dawson. 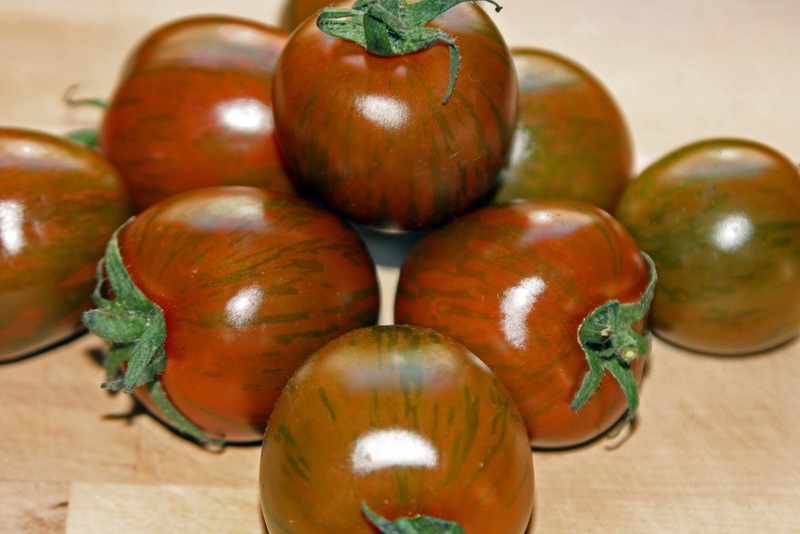 These tomatoes are vigorous, plants that produce 4 oz., 1 1/2”, juicy, round tomatoes with purple/mahogany colored skin and green stripes. Great smokey and sweet flavor. This is one of the most unusual variety you’ll ever grow! Fully ripened fruits are bright green, with stripes of a still lighter green. Round, smallish, 2 to 4 oz. fruits have excellent, tart, “real tomato” flavor.